This is by far my favorite. I love that you can still see the lines they used to keep the lettering straight. I guess they never thought of a chalkbox or masking tape. And the image at the top of this is amazing. I kind of wish the lichen wasn't there so I could see it more clearly. Hey, did you know that lichens are a symbiotic relationship between fungus and algae and that some lichens...ah, lichens obviously need their own post. Look for that soon. The lichen must be periodically cleaned off these markers, I'm surprised that really only one had so much on it. 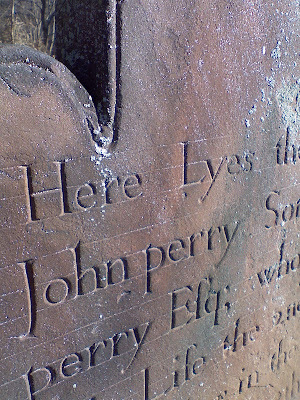 The lettering is so clear and crisp here I thought my eyes were playing a trick on me with the angle of the sunlight. It was actually ridiculously clear on many of the stones and with the sun hitting it from the side it looked so beautiful. Click on the picture and look up close. Wow. I wonder who these people were. Even though they died so many years ago, many of them lived into their 70s. Gerry, didn't you used to play poker with a few of these guys? 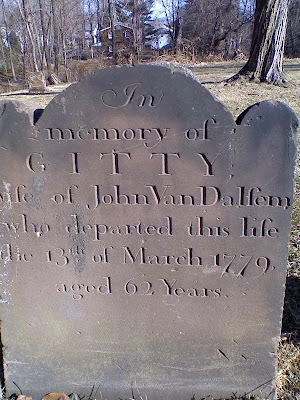 You'd appreciate Dorothy W. Mellet's books/studies on Rockland's gravestones. 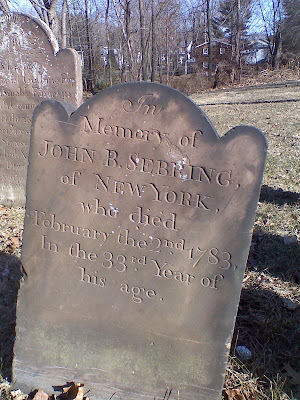 A lot of interesting info, a lot of photos, and if I recall right, quite some info on the cemeteries in Tappan and the stones found in them. Bob Protzmann, husband to People to People's Linda Protzmann, also has done a lot of rockland cem. research as part of his geneology work. I think you'd rather enjoy Rockland Cemetery in Sparkill - loads of history in that place, and it's very beautiful up top. Oak Hill in Nyack, too - the one opposite the hospital - beautiful place, tons of history. Probably, the rules were scribed into the stone so they'd last long enough for the chiseling tradesman. - wasn't sandblasted in those days, and one would require longer-lasting marks than a chalk line could provide. Since that's some sort of sandstone or similar (as opposed to the granite used in later years), Moh says that it's so soft that the marks would necessarily have been scribed in, I expect. We can ask The Man. I'm going to check those books out. 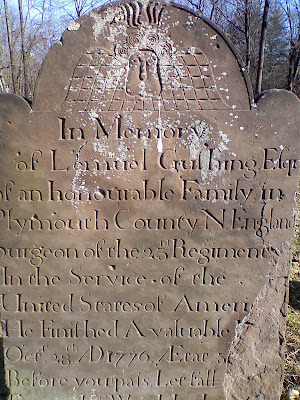 In the course of my article research I came across many mentions of Rockland Cemetary and the people buried there- so interesting. I'd love to hear what Digger has to say. As a child growing up in Queens, my aunt and uncle used to take me to the cemetaries (Woodlawn especially) to feed the ducks. That place is incredible.